Husband of Ada Banks, of Hope Villa, Burlands Road. Injured at 74 Wood Lane; died same day at the Cottage Hospital. When enemy planes were over a West of England town in the early hours of Monday morning, a canon shell went through the roof of the house of John Banks. At the moment Mr Banks was dressing and he was struck by the shell receiving severe head injuries. He was taken to the hospital where he died a few hours later. 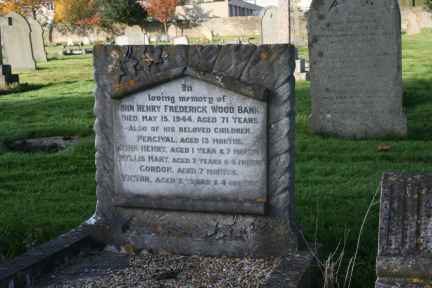 Deceased served in the Wilts regiment in the South African War and also in the last war. A canon shell also went through the roof of Mrs Kingston’s house nearby. Another hit the home of Mrs Archard, wife of Colour Sgt RG Archard, RM. Mrs Banks and family wish to thank all those who sent floral tributes and letters of sympathy in their bereavement.